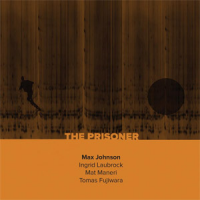 The Prisoner represents the fourth record by bassist Max Johnson as a leader. At age 24, that is quite the accomplishment, not only because he has done so much such a short time, but also because this new record represents such a startling new stage in his development as a composer and conceptualist. This record possesses true aesthetic vision and is the most vivid, daring work Johnson has done to date. A great deal of this record’s success is due to Johnson composing music that places the strengths of the other players front and center. The vibrant, at times mournful, and always soulful playing of Maneri sings through this record from the opening lines to the final notes. Maneri, one of the most original voices on strings of our time, plays here as if his very life depends on it. He takes us all the way from moments of sorrow and melancholy to the highest peaks of profound exuberance. Laubrock plays a more subtle role, accenting and supporting, lifting and shifting–a generous role-player throughout. And Fujiwara seems to put his sound everywhere it is needed, sometimes in booming doses, at other times more slyly. He impresses throughout with his great command of that lost art of brush work on drums. “No. 6 Arrival / No.58 Orange Alert” begins with Maneri and Laubrock playing a sorrowful opening, accented by light touches of drums and bass. But it soon builds in intensity with rhythm creating complex underpinnings over which sax and viola rise and fall. Fujiwara finds his way into the passageways left open by the others and exhibits some of the most thoughtful and engaging interaction on the record. “X04” takes a whimsical turn, but is grounded by Fujiwara’s adherence to a mood consistent with the tune. This track features some of the most intriguing interplay between bass and drums, that together create an aqueous composition. The tension between turbulent and relaxed elements pull at the very architecture of the piece, stretching it out from its center though never to the point of dissolution. Emerging from that comes Maneri’s bold viola. “No.12 Schitzoid Man (Gemini)” is a nice shift in feel towards a looser composition where we can hear great individuality in the voices, though often intertwined. “No.24 Hammer into Anvil” opens with Laubrock in the upper register, seeming to announce that the record is suddenly moving in a new direction. Once the sidemen rejoin after a bass solo, this music then surges towards ethereal heights before dissolving into separate slicing voices. Then they rise again in tumult, building towards a precipice. “No. 48 Living in Harmony” opens with the disparate voices of the musicians calling to one another, as if communicating across some distance. Then, gradually, they meld into a confluence of both mood and sound. On “The New Number Two” we get to see Maneri get his greatest exposure. “No.2 Once Upon a Time / No.1 Fallout” is a fitting conclusion with Maneri playing in repetition under a bass solo. Viola then grows in agitation with others colliding in electric interactions. Building on an already impressive discography, Max Johnson has reached a new threshold with this record. The Prisoner should have broad appeal to listeners of music from across the jazz spectrum, avant pop, and string music of all kinds.